Many believe that we could see silver, in the next 10 years, increase in price by 500%. Others believe we will see this price move in three years. 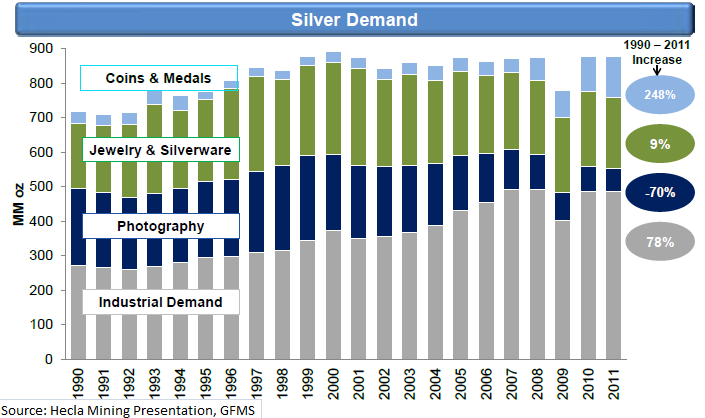 Over the first decade of the 21st century, silver did indeed increase in price by 500%. It, along with student loans, sowed one of the best decades – performance-wise – for an asset, and there’s no reason this should conclude. To be certain, within three years, silver will have moved 500%, but this is not necessarily due to a hyperbolic stage in this secular bull market, but, rather, due to the inherent volatility in silver. You might see a 10 percent move in silver one day, 5% up and 5% down, meaning an end at a neutral price. But, will silver move, within three years, 500%? Mainstream press outlets have published this sentiment, while other, more conservative analysts, have deduced that the 500% mark will be reached again in ten years, just as was achieved in the past ten years. Silver demand has increased by 248% from 1990-2011. Since 2007, silver ETF holdings have risen to record highs. The 100 ounce Silver Bar isn’t for everyone. After all, just one costs more than $3,000. But, nonetheless, for someone really stacking, the 100 ounce bar, in my opinion, is the ideal fit, even more so than 1,000 ounce Silver Bars. Why? Well, I think that before one begins needing to purchase 1,000 ounce bars, then they ought to buy some platinum, gold and palladium. If one is looking to buy their first 1,000 ounces of silver, then best go with ten 100 ounce bars or an assortment of 1 ounce rounds, 10 ounce bars, Silver Eagles (or your respective country’s official coin) and 100 ounces bars. The 1,000 bar is for the ultimate stacker, who also has hoards of platinum and gold at least, as well as food and water stores. One unfortunate arisen from the 100 ounce bar is that when liquidation comes, then your holding the equivalent of two ounces of gold per item in current dollar denominated terms. This is certainly inconvenient in the event that change is needed or that you need to find a dealer with cash or check on hand to purchase it. Better bet is to buy plenty of silver in smaller denominations and get some platinum and gold and palladium on the appropriate dips.